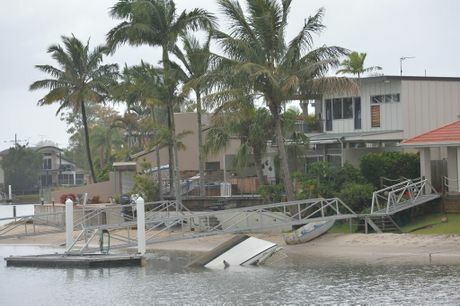 A SUNKEN boat in Mooloolaba's canal has generated plenty of chat among neighbours since it went under about a week ago. It has also highlighted the responsibilities of boat owners to retrieve their vessels when they sink. 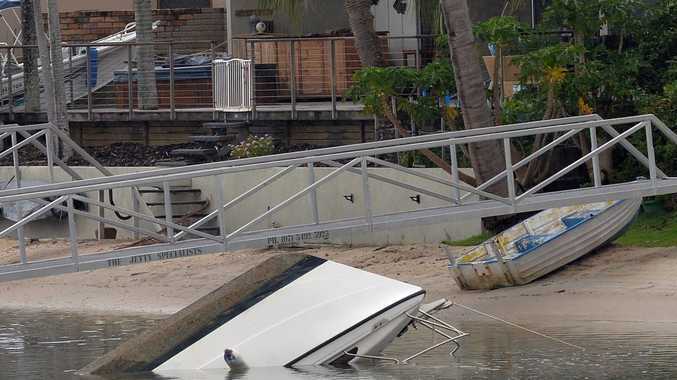 Residents in the area around Admirals Ct, Carathool Pl and Coppabella Cres noticed a boat moored to a resident's pontoon had overturned and sank earlier this week. Only the boat's bow, secured by ropes to two palm trees, had stayed above water. The boat had been a long time fixture at the rear of a Carathool Pl home before it was moved earlier this year to a pontoon at Coppabella Cres. Residents at both the homes declined to speak to the Daily about the boat. A Maritime Safety Queensland spokesman said they were aware of a submerged boat in the canal. "We have ensured there is no pollution risk or hazard to navigation and are working with the owner to have it removed," the spokesman said. He said marine officers were monitoring about 18 derelict vessels on the Coast to ensure proper risk management. "None currently pose an imminent concern to safety or the environment. It is always the owner's responsibility to remove or maintain a vessel which poses a risk to navigation or the environment. "We work continually to resolve issues of derelict vessels in Sunshine Coast waterways and we take seriously reports of vessels that might be unsafe or at risk of sinking."